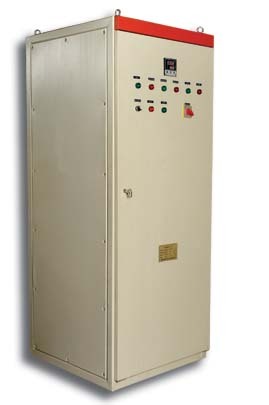 KQR series liquid resistor starter is a new generator starting control device that further improve the starting performance of the large and medium size wound rotor motors. Through connecting liquid resistor in the rotor winding of controlled motor, the starter automatic starts, steplessly, continue working in scheduled time to change the starting current make the motor start smoothly under the condition of perfect starting current. The motor, equipment and power line are protected effectively. Compared to other types starter, this kind of starter have advantage of higher automation, lesser starting current, energy saving and small impact on electric and mechanical etc. features. Especially suitable for the over loading starting. The starter can also start smoothly although at a lower power line voltage, which decrease the capacity of transformer. It is the best starting control device for those over loading equipment such as ball mill, crusher, elevator, compressor, fan, pump etc. The performance is better than other type starters. Small starting current, which is less 1.3 times of rated current. It can start continuously for 5-10 times. Starting is smooth, mechanical stress impact is little. Motors and driving machineries can be protected effectively. The equipment can be start in lower voltage: 6kV motors and 380V motors can be smoothly started at the voltage 5.5kV and 340V accordingly. The simple and reliable structure. Automatic operation, easy install and maintenance.